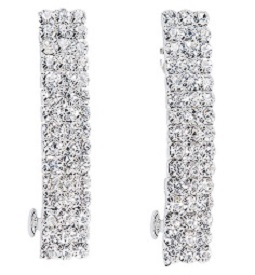 Each gently curved, bar barrette features three rows of stunning rhinestones. The French barrette clip is silver-toned. Set includes 2 rhinestone hair barrettes. Size "2 x 1/4"
FWO Extras: The approximate size of each rhinestone barrette is 5/16 inch wide x 2 inches long.